Some say that there’s nothing to watch on TV, anymore. It’s all the same thing or none of it makes sense. We’re starved for the comforting reminder of days gone by, of important shows that really connected with the crucial things that were on all of our minds while also managing to be entertaining, stylish, contemporary, and, above all, capable of keeping the party going on! A couple buds had kept that dream alive in their basement with their daytime public access TV show, Wayne’s World, but it’s been gone for so long. 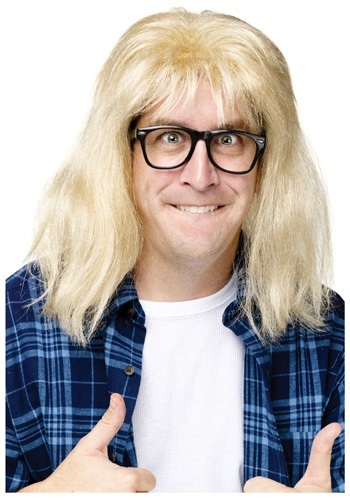 Fortunately, though, you can bring it back on the air and live with this SNL Garth Algar wig. Keep your locks golden blond and in perfect 1990s style with this completely synthetic and totally styled hairdo. The elastic lined interior keeps it comfy while you’re rocking out—and we’ve even included the equally radical black frame and clear lens glasses to ensure that you are excellent in your role. Now just get that voice warmed up because… It’s Wayne’s World… Wayne’s World… Party Time… Yeah. You’re ready.Excellent!